Councillor John Roscoe graduated from Shelburne Regional High School in 1984 and from Acadia University in 1988 where he received a Bachelor of Science in Recreation and Physical Education. He began teaching at Sandy Point Consolidated School and is currently the principal at Hillcrest Academy. Councillor John Roscoe has been an active member in the Jordan Volunteer Fire Department since I988 and has been filling the role of Deputy Chief for the past seven years. He was Elected to Shelburne Municipal Council in 1994, 1997, 2000 and 2004, District 5 (East Jordan, Jordan Falls, Woodlawn Drive, and Jordan Branch). 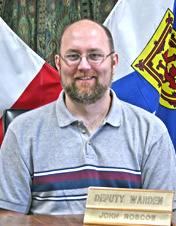 From 2004 to 2012 he acted as Deputy Warden for the Municipality of the District of Shelburne.